Educators who want to help children develop to their full potential must educate the whole child by addressing physical, mental, and emotional needs. Many programs at elementary schools focus on academic and emotional development, but how many address children’s physical development? Jump over the noodles, taking off and landing with both feet. Each time you jump, say a letter of the alphabet starting at the beginning. Continue in alphabetical order and see how many times you can say the whole alphabet in three minutes. Using jump ropes or tape on the floor, create a series of lines in a pattern similar to that of spokes on a wheel (see diagram). Place active learning cards (in any order) in each space between the lines. 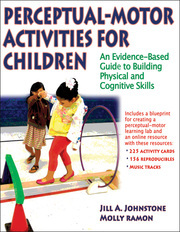 Perceptual-Motor Activities for Children: An Evidence-Based Guide to Building Physical and Cognitive Skills contains 200 station activities that you can use to develop perceptual-motor skills in kids from preschool through elementary grades. The activities can be used in a 32-week sequential program or individually. You also receive a web resource that offers activity cards, bonus activities, active learning cards, audio tracks, a record sheet, and other tools.